Opening Day is Sunday, April 28. 11:30 is a steward led hike on the NEW TRAIL! Come join us and enjoy the trail CLOSE UP. . .NO thistles in sight! One of the things I’ve enjoyed the most about becoming a Sonoma Overlook Trail Steward is being part of a motivated, energetic, and inspiring group of individuals who all love the land and hiking out in it. But now and then I’m reminded that the official stewards group is only the tip of the spear, as it were, in keeping the trail safe and well-maintained. This week was one of those times. Usually I’m out on the trail every day when I’m not away, but this week found me in bed on Monday with a cold I caught in the wake of two weeks in Thailand. Literally on my sick bed I received a text message from Melissa Beasley, a friend who is a yoga teacher for The Lodge and also leads hikes on the Overlook Trail several days a week. She had in turn received a text message from her colleague Lisa Turchet, who also is a yoga teacher for The Lodge and also leads those hikes. 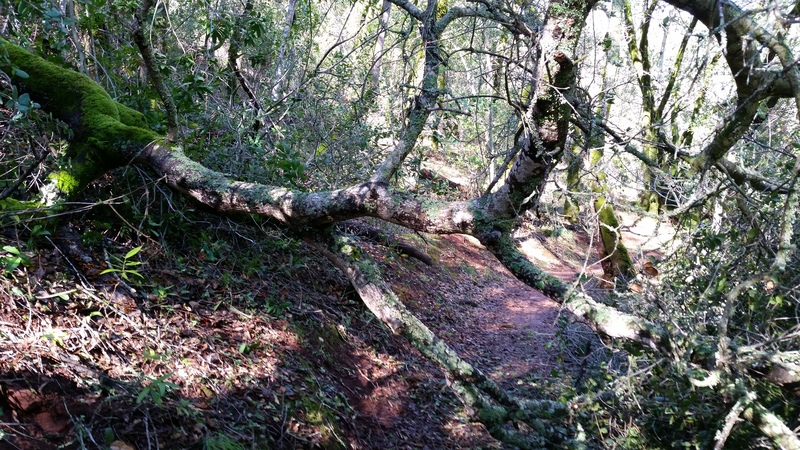 Lisa was warning Melissa about a tree down on the trail (see photo), and suggesting she might want to consider alternate routes for the hikes she might lead later in the week. Before I had even gotten out of bed, I fired off an email to a couple colleagues who assist with trail maintenance, Lynn Clary and Bill Wilson, hoping that one or more of them could get by there and help mitigate the hazard. Bill also serves as our liaison with the City, so I knew he would report it to the City so they could come out with a chainsaw and do a full removal. Sure enough, within hours Lynn, Bill, and Richard Gibson, another steward, were on it and had at least made it possible to more easily pass with care. Since Monday was a City holiday, it took another day or two to get it fully removed, but now it no longer presents a hazard. All told, at least six different individuals or groups were involved, working in concert, to get this resolved, and only half were actual trail stewards. This experience is not rare, but it served to remind me how we stewards serve within a much larger community of those who care about the trails and the land that they pass through. It takes a team, and that team is much larger than I think any of us can fully grasp. Thank you all, for your love and support. It’s appreciated. EDITOR: My wife and I are part-time Sonoma residents, but one of the resources we have enjoyed since arriving a few years ago is the wonderful Sonoma Overlook Trail just on the northern edge of town. We especially like the combination of shade and sun, forests and grasses, while making the gentle climb to the top. It’s not even a mile from Mountain Cemetery to the peak and less than a 400-feet elevation gain, but the reward is a stunning view of Sonoma and the surrounding countryside you can’t get anywhere else so close to town. Last week we could see the Salesforce Tower and the Bank of America building looming over downtown San Francisco. 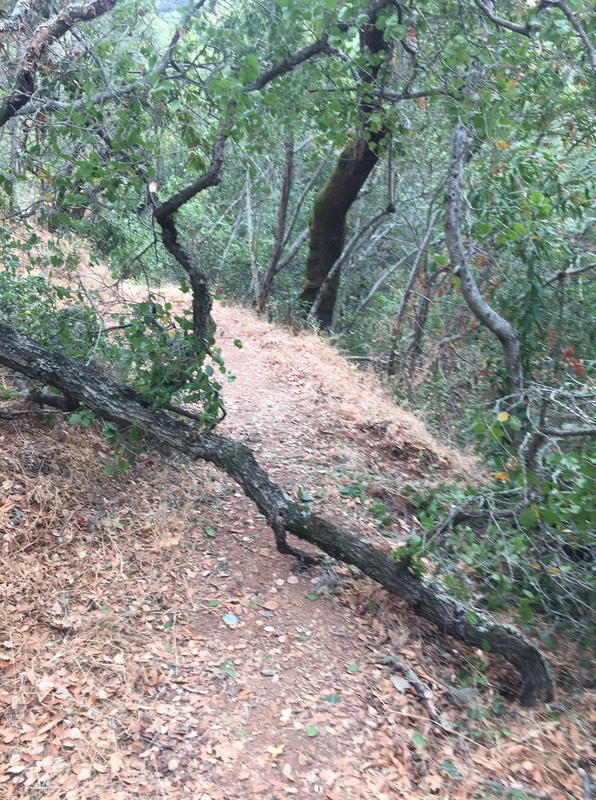 Our only minor complaints were that the trail was very rocky and steep in some areas, and suffered erosion both from downpours and from hikers straying off the paths. A set of stairs to assist hikers and improve drainage. 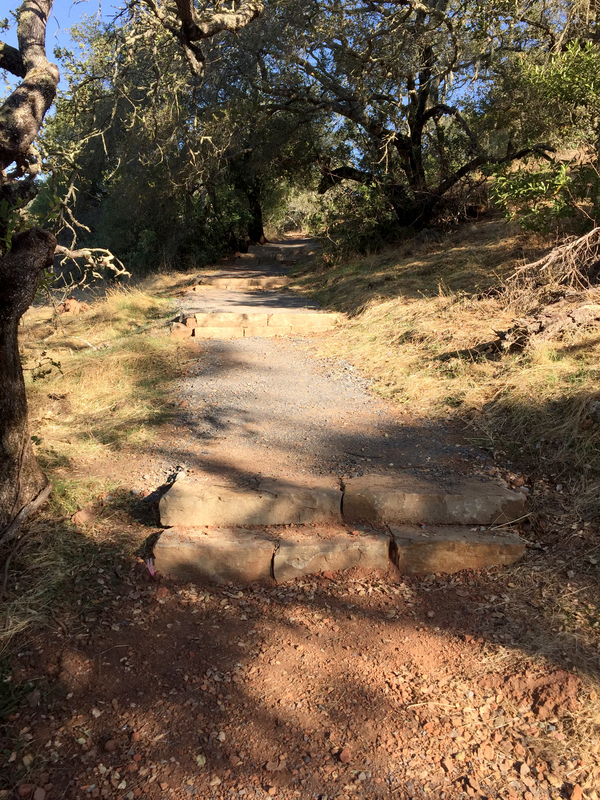 Imagine our delight returning to Sonoma this autumn to find a renovated trail complete with drain dips and water bars, graded and stabilized paths, and a series of beautiful stone steps making the trail even more accessible and inviting. We prefer going up through the cemetery at the top of Second Street East, but you can drive to a number of accessible starting points and park for free everywhere. 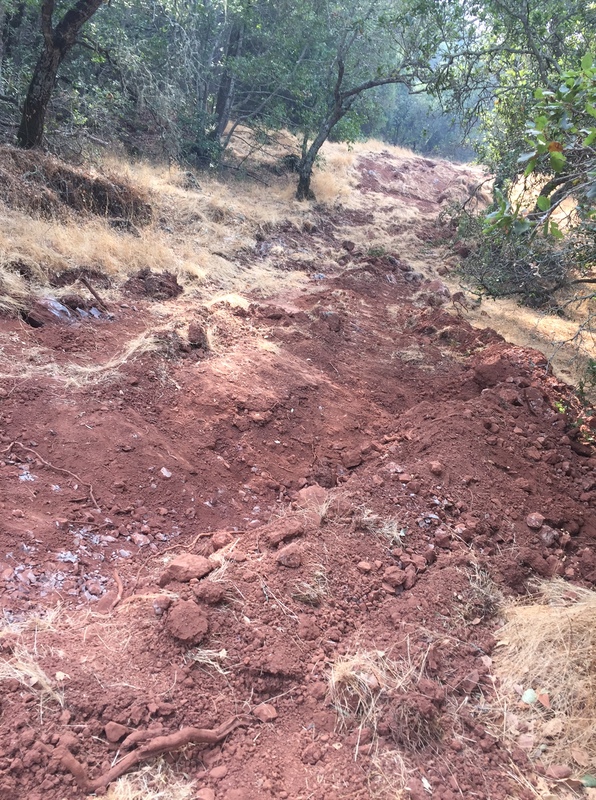 We want to thank the Sonoma Overlook Stewards led by Joanna Kemper, Sonoma’s Public Works Department, the Sonoma Ecology Center, and those 12 hardy young people from the American Conservation Experience – how they moved those huge stone steps up the hill will forever remain a mystery. We are grateful to all of you for making a wonderful resource even better. Thanks, Richard, for taking the time to write such a nice letter. You’re welcome! The Upper Overlook Trail is Now Open! The Sonoma Overlook Trail Stewards are delighted to announce that the upper part of the Sonoma Overlook Trail is now open to hikers! “Upper part” means that you can’t access the lower trail that starts at the kiosk parking lot. But you may park there and hike through the cemetery up to the Toyon Trail, and access the upper part from there. There are also a limited number of parking spaces at the Toyon Trailhead, so alternatively you could drive through the cemetery and park there. If you do, please be advised to be out of the cemetery by 4pm, as the City locks the cemetery gate between 4 and 4:15pm. Alternatively, the upper part of the Overlook can be accessed from the Rattlesnake Cutoff trail from the Montini Preserve. Some hikers like to park at the 4th St. entrance to the Montini Preserve (cross-street is Haraszthy), hike across the Montini to the Overlook and back (that’s my personal favorite hike). Or, you could park in the parking lot at the Sheriff’s Office and Field of Dreams, hike up to the Spotted Fawn Trail and take that to Rattlesnake Cutoff. While hiking the upper trail again, you will notice that a lot has changed. The most obvious changes are new features — stairs, stone-lined drainage channels, substantial rock walls supporting the trail, small gravel that has been used to build up the trail to improve drainage off the trail, and new and substantial drainage channels. This work has the dual goal of both improving the quality of the hike for hikers, including increased safety, as well as getting rainwater off the trail quickly and appropriately, thus minimizing damage that can come from running water. You will also notice new signs. These signs are temporary, but they are intended to model the eventual permanent replacements. We want to place these temporarily so that we can gather feedback from hikers whether they serve the required purposes of clarity and appropriate information. Please let us know what you think by sending an email to overlookmontini@gmail.com. Also, as always, let us (the volunteer stewards of the trail) know if you have any questions or comments on this new work or anything else. On June 17th The Sonoma Overlook Trail will be closed for a re-routing and rehabilitation project. More information is on the City of Sonoma’s web site, including alternative places to hike (the Montini Trails chief among them). Today I was reminded why it’s important to have people dedicated to hiking our trails and doing all of the various jobs required to keep them well cared for and safe to use. Hiking along the Rattlesnake Cuttoff Trail, from the Montini property to the Overlook, I was surprised to see a tree across the trail (see pic). I was surprised, as I didn’t recall any storm or high winds recently. But there it was anyway. I immediately took a picture and sent it off to the Chair of our stewards group, Joanna Kemper, who will work with the City of Sonoma to have it removed. 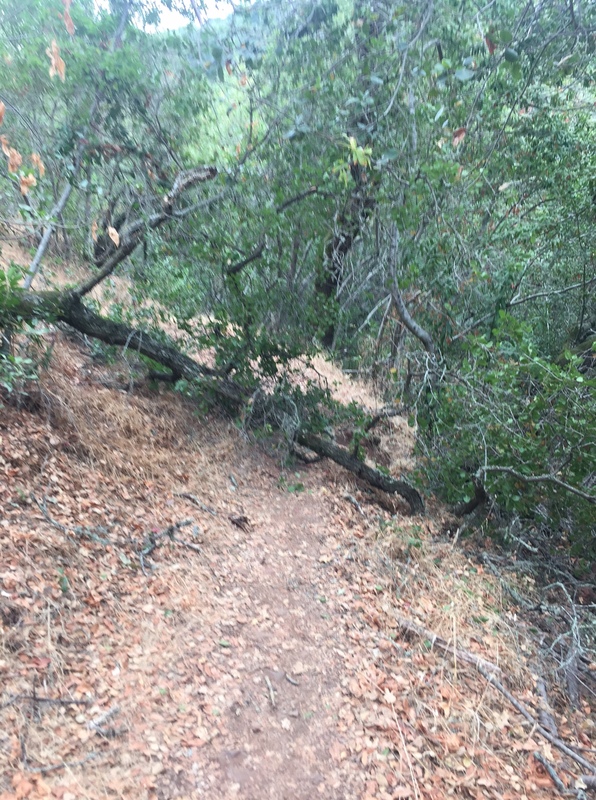 On my way back, I pulled out my handy Leatherman knife, which has a fairly good saw blade, and hacked off enough branches so at least the trail could be used until the City could come in with their chainsaw (see pic). This is, of course, just one of many jobs that we volunteer stewards perform. For example, Fred Allebach is very active in various physical trail maintenance activities such as cutting drainage channels to make sure water flows off the trail as soon as possible. Lynn Clary has been known to hike his battery-powered Sawzall saw up the trail to take care of an overhanging limb. We likely all pick up trash when we see it. Speaking of which, what do you think is the most-encountered piece of trash? Beer cans? Nope. Coffee cups? Close, but no cigar. It’s facial tissues. Yep, the hands-down favorite discarded item of trail hikers. And just think of it — I get to pick it up and put it in my pocket. So…yeah. Please don’t throw things on the trail. Just don’t. We do other things too, such as raising money to do trail work that we can’t do ourselves, soliciting donations for building benches, pulling invasive non-native plant species, cutting back poison oak, and leading school trips. But it’s a labor of love, as we all love the trails and the properties they traverse. And we know that many others do too.